The Universidad Francisco de Vitoria is hosting an international, interdisciplinary congress to mark the 50th anniversary of May 1968 and the so-called sexual revolution. This occasion will explore the background and causes of these historic events, as well as their impact and implications for people across the social spectrum. The Congress will draw distinguished speakers and attendees from all over the world. It will adopt a multidisciplinary approach (incorporating such diverse strands as science, anthropology, ethics, bioethics, law, sociology, education, psychology, art, politics and theology, among others) to tackle fundamental subjects such as human dignity and love, sexual corporeality, and emotional and sexual education. It will be an opportunity to delve deeply into these issues and to dialogue with people and research groups from a variety of countries and fields. In addition, the event seeks to prompt a wide-ranging, comprehensive, interdisciplinary discussion on sexual identity and gender, their anthropological foundations and their consequences on a practical level. The aim is to inform and guide the worlds of culture, teaching, education, law and communication with respect to these pivotal matters. After the Congress, papers and other materials presented will be published in print and digital formats. 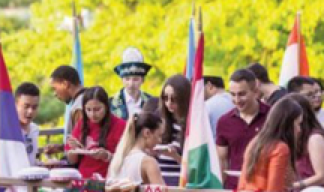 The Congress is aimed at the academic world, as well as anyone else interested in the subject matter, whether they hail from the cultural or educational spheres or public or private institutions. Delve deeply into the historical, ideological and cultural backdrop against which the sexual revolution unfolded. Analyse its impact on people and society at large. Offer a comprehensive anthropological overview of the beauty of human sexuality and man- and womankind's mission in the world. Submissions will be assessed and selected by the Congress's Scientific Committee, who will notify authors whether their paper or poster has been accepted or rejected. 1st November 2018: Deadline for the submission of papers and posters. The presentation of an abstract will be accepted until November 1st, and then the subsequent sending of the communication on November 1st. The cover page should state the paper title, the author's name, the institution where he/she works and his/her email address. It must also include a 300-word abstract in Spanish and English and three keywords, also in Spanish and English. Papers must be a maximum of 3,000 words long and should be submitted as a Word document in the following format: Times New Roman, font size 12 pt, with 1.5 pt line spacing. The APA citation style should be used. e.g. RAMÓN Y CAJAL, Santiago, Recuerdos de mi vida, Editorial Juan Pueyo, Madrid, 1923, p. 155. Submissions must be accompanied by a short (maximum ten-line) CV outlining the author's academic background and career, including details of his/her three latest publications. As for posters, these should be submitted in PDF with a written description. The aforementioned criteria for paper submissions also apply here. Submissions not complying with these rules shall be deemed ineligible. The best submissions will be published in the Congress proceedings. November 8, 9 and 10 at 8:30. University Francisco de Vitoria, Chapel in the Main Building. Campus map (haga clic aquí). M-515 (Carretera de Castilla): form Madrid towards Pozuelo-Majadahonda. After 4 roundabouts, take exit nº 13. M-40 (From A-5): Exit 40: Pozuelo (M-503) & M-515 (From la A-6): Exit 41: Pozuelo (M-503) & M-515. A-6: exit 11 to M-40 (towards Badajoz NV), exit later exit 41 towards Pozuelo (M-503) & take bypass M-515. Taxi cabs often wait in designated ranks that are clearly signposted at central locations or by spots such as Castellana street. You can also hail a taxi in the street. If the rooftop light is illuminated with a green light it means the taxi is available for hire. You can also call a taxi on the numbers above or through Cabify, Mytaxi or Uber apps. María Lacalle. Profesora Titular de Filosofía del Derecho, Universidad Francisco de Vitoria, Madrid. Elena Postigo. Profesora Adjunta de Filosofía y Bioética, Universidad Francisco de Vitoria, Madrid. Ricardo Abengózar. Médico y director del Instituto de Bioética de la Universidad Francisco de Vitoria, Madrid. Ana Arenas. Jefa de prensa, Universidad Francisco de Vitoria, Madrid. Max Bonilla. Teólogo, investigador y profesor de Humanidades, Universidad Francisco de Vitoria, Madrid. Amalia Casado. Directora de Comunicación Institucional, Regnum Christi España, Madrid. Isidro Catela. Doctor en Comunicación, profesor de Ética y Deontología Profesional, Universidad Francisco de Vitoria, Madrid. Pablo Cervera. Doctor en Teología por la Universidad Gregoriana y escritor, Madrid. Carmen Cid. 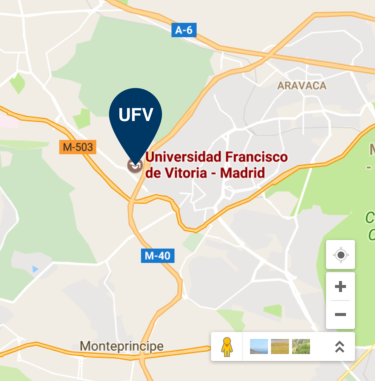 Departamento de Eventos, Universidad Francisco de Vitoria, Madrid. Arturo Encinas. Profesor de la facultad de Comunicación, Universidad Francisco de Vitoria, Madrid. Amalia Faná. Profesora de Humanidades, Universidad Francisco de Vitoria, Madrid. Miguel Gabián. Economista y empresario. Nieves González Rico. Directora del Centro Diocesano de Orientación Familiar de la Archidiócesis de Valladolid y del Instituto Desarrollo y Persona, Universidad Francisco de Vitoria, Madrid. Belén Ibáñez. Directora adjunta del departamento de Relaciones Institucionales, Universidad Francisco de Vitoria, Madrid. Ana Mezquita. Coordinadora General de Eventos y Actos Académicos, Universidad Francisco de Vitoria, Madrid. María Pérez de Ayala. Directora general del departamento de Relaciones Institucionales, Universidad Francisco de Vitoria, Madrid. Rocío Solís. Coordinadora del Instituto John Henry Newman, Universidad Francisco de Vitoria, Madrid. José Ángel Agejas. Profesor Titular de Humanidades, Universidad Francisco de Vitoria, Madrid. Ángela Aparisi. Catedrática de Filosofía del Derecho, Universidad de Navarra, Pamplona. Justo Aznar. Director del Instituto de Ciencias de la Vida, Universidad Católica de Valencia. Juan de Dios Larrú. Profesor numerario de Teología Moral de la Universidad Eclesiástica San Dámaso, Madrid. Ángel Barahona. Director del departamento de Formación Humanística, Universidad Francisco de Vitoria, Madrid. Saray Bonete. Profesora Adjunta de Psicología, Universidad Francisco de Vitoria, Madrid. Francisco Bueno. Profesor de Estética de la Universidad Francisco de Vitoria, Madrid. Elio Gallego. Profesor Agregado de Teoría y Filosofía del Derecho y Director de Instituto de Estudios para la Familia, Universidad CEU San Pablo, Madrid. David García. Profesor de Humanidades, Universidad Francisco de Vitoria. María Lacalle. Profesora Titular de Filosofía del Derecho, Universidad Francisco de Vitoria. Vicente Lozano. Profesor agregado de Ética y de Metafísica, Universidad Francisco Vitoria, Madrid. Antonio Martínez. Profesor en Derecho, Universidad Francisco de Vitoria, Madrid. Tomás Melendo. Catedrático de Filosofía, Universidad de Málaga. Miguel Ortega. Profesor de Humanidades, Universidad Francisco de Vitoria, Madrid. Elena Postigo. Profesora adjunta de Antropología y Bioética, Universidad Francisco de Vitoria, Madrid. Javier Rubio. Profesor de Filosofía, Universidad Francisco de Vitoria, Madrid. Cristina Ruiz. Profesora de Educación y Humanidades, Universidad Francisco de Vitoria, Madrid. Ángel Sánchez-Palencia. Profesor titular de Filosofía, Universidad Francisco de Vitoria, Madrid. Jesús Santos. Profesor de Filosofía del Derecho, Universidad Francisco de Vitoria, Madrid. Susana Sendra. Profesora de Humanidades, Universidad Francisco de Vitoria, Madrid. Juan Serrano. Profesor de Humanidades de la Universidad Francisco de Vitoria, Madrid. Álvaro de la Torre. Profesor de Derecho, Universidad Francisco de Vitoria, Madrid. Lorena Velasco. Profesora de Derecho, Universidad Francisco de Vitoria, Madrid.